When I bought my first stock Nortel, (NT) which filed for bankruptcy protection recently, more than six years ago, I didn’t know much about investing or trading stocks. The reason I bought NT was simply because it was cheap in dollar amount. That’s right. How much could I lose with a stock at $0.47 a piece? Since then, I have bought and sold many stocks. 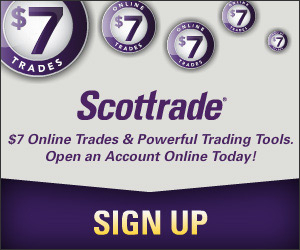 Some I have turned over only after holding them for a few days, like those I bought through Scottrade recently, to make a few quick bucks. Some I have been holding for years and have no plan to sell, such as China Life Insurance (LFC) and Visa (V). For all those trades, I applied little, if any, technical analysis in determining when to buy. While timing doesn’t really matter too much if I want to hold the stock for years, it has been proven deadly for some stocks that I never had intention to keep. Then I never seriously learned anything on technical analysis either, except reading pieces of information here and there. The book, Come Into My Trading Room, A Complete Guide To Trading, by Alexander Elder, is the first book I read on technical analysis. Alexander Elder’s book is really eye opening for me and I wish I had read it early, not until now. Though I ever wanted to be a trader and won’t become one, I do want to improve my trading so my trades can be more profitable. Dr. Elder’s book offers insights from a very successful trader, from whom I can learn a lot. In the book, the author shared what he called the three M’s for successful trading: Mind, Method, and Money, which are described in the book as the trading psychology, trading method, and money management. Dr. Elder spent a lot of time discussing technical analysis in the book. In the trading method part, the author explained in great details on how to read stock charts and how some widely technical indicators work. Though there are many tools a trader can use to make trading decisions, Dr. Elder cautioned against using too many indicators. If 5 signal can’t make a trader feel confident about a trade, 5 more aren’t likely to help. So in the book, the author focused on 5 indicators: moving averages, channels, MACH-Histogram, Force index, and one from several candidates such as Elder-ray and Stochastic, etc. The goal, of course, is to help a trader develop confidence. Among the five indicators, Force Index is actually Dr. Elder’s own secret weapon, which helps identify market’s turning point by putting price change and volume together. Though the book has been published for nearly 7 years and the author claimed that Force index has been adopted in many technical analysis tools, I wasn’t able to find it in a few that I am using. So I have to plot it myself to see how it looks and how to use it. 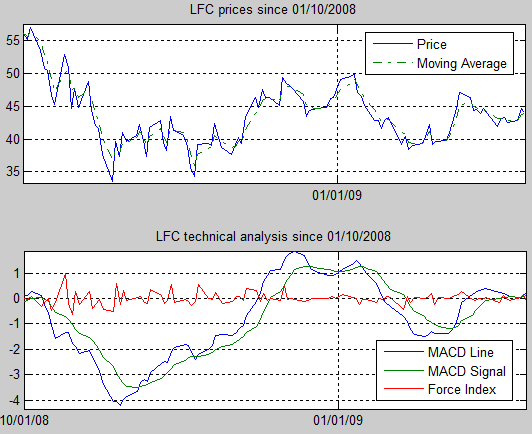 I have written a small MATLAB program to do my own analysis using Force Index (the red line in above plot) and other indicators. In addition to trading method, Dr. Elder also spent a good deal of time discussing trading psychology and money management, two essential pieces of being successful in stock trading beyond the trading techniques. One of the method he suggested every trader do is recorder keeping (write down the purchase price, print out the chart, etc). As a trader learns from the stock market, he/she needs to constantly go back to his/her trades to identify errors so they won’t be made again in the future. He also recommended dividing the trading account into several parts such that the whole account won’t get hurt too badly if one part doesn’t do well. I am still absorbing some concept from the book and trying some ideas myself, but so far I think the book is a good read.